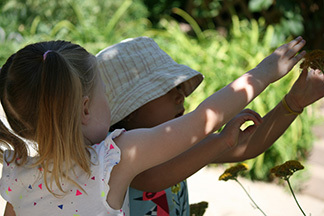 At Children’s Garden, we strive to build relationships and strengthen connections – between one child and another, between ourselves and the children in our care, between children and their families, between children and the natural world, and between ourselves and others who might look different, speak differently, or come from far away. Yet another relationship than we explore is that between Montessori Curriculum and Reggio Emilia Philosophy. 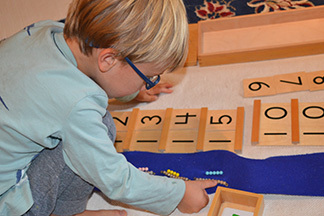 Like Maria Montessori, our teachers follow each child’s development through careful observation. Additionally, we embrace the Reggio Emilia view of the importance of community and creativity in the social construction of young children. We believe that the process of viewing young children’s behavior from the different angles suggested by these approaches has enriched and deepened our understanding of what we see. We see ourselves as ongoing learners, so this study of combining two ways of educating young children is both stimulating and inspiring. Dr. Maria Montessori began her work with children in the early 1900s. She was the first woman to receive a medical degree in Italy and with her medical background began working with pediatric psychiatric patients in Rome. Through careful observation of those children, she began to develop an approach to working with preschool aged children that was revolutionary in her day. After achieving success with children previously thought uneducable, she began working with typical preschool aged children, and began to develop an approach to education and a body of didactic materials which are still used in Montessori schools today. Additionally, Dr. Montessori observed that younger children learned from older ones, who in turn derived pleasure and solidified their understandings by being a helper to younger ones. Thus, she grouped children in mixed age groups to maximize their learning. Because of her view of the child as responsible and compelled to follow his/her own learning path, she had a vastly different view of the teacher. In her schools the role of the adult, or teacher, became a guide to children, responsible for preparing and maintaining a rich, child sized environment, and for providing a link between the environment and the child in the form of carefully practiced lessons with the materials in the classroom. 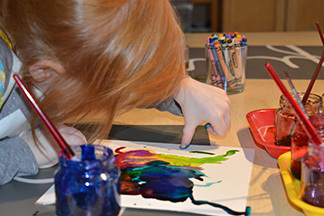 The Reggio-Emilia approach is a research-based approach to learning that focuses on social constructivism and creative expression within a cultural context. The Reggio Emilia educational philosophy comes from the city of Reggio Emilia in the northern Italy. Reggio Emilia was heavily damaged during World War II, leaving families concerned about the education of their young children. After the war, parents of the city sold a few horses and a tank left behind by Germans forces, and began to build a school for their children. They were joined by educator Loris Mallaguzzi, and together they began to develop schools they hoped would education children who were so secure, so intellectually and emotionally strong, and so connected with society, that never again could a Hitler rise to power in the world. Mallaguzzi believed that children used “a hundred languages” to construct their understanding of the world – they talked, wrote, painted, danced, sang, hopped, drew, laughed, sculpted, imagined as they explored their world. For those of us who have made it a career to observe young children, the notion that they use all their diverse powers to make sense of the world is easy to accept.